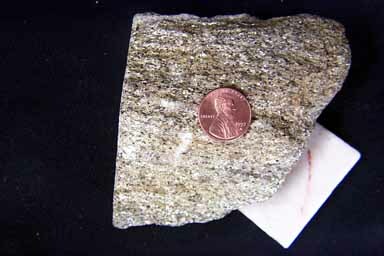 Schistose foliation composed of well intermixed quartz, feldspar, and muscovite (with biotite and possible amphibole). Schists have quartz and feldspar intermixed with a mica mineral, either muscovite or biotite, or both. In this specimen, and unlike specimen #1 muscovite dominates, giving it its light color. Often other minerals are present too, such as garnet and staurolite, but none are present in this particular specimen.